I'm planning a vacation to Europe this summer and have been searching endlessly for a comfortable, yet slightly fashionable, shoe. I remember walking a ton in Taiwan and I know that Europe will be no different. However, I don't want to bring sneakers because they're bulky and they just don't look very dressy. (My uncle has a theory that you should always dress nicely when traveling abroad, simply because you'll be taking several pictures in your travel clothes...and don't you want to look your best?) I've already started to assemble my travel clothes...a simple black dress that you can dress up or down, a pair of floods, a khaki skirt, and a few tops. I'm planning on traveling light. 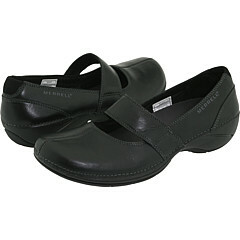 The above shoes are from a brand called Merrell, which is very popular in Europe. I ordered them on Zappos.com and they aren't as comfortable as they look, despite all of the favorable reviews. I think they will chaffe a bit along the insole as they are a bit stiff in structure. But they do look classy (and conservative, I admit). I think I will keep looking.